At 2:40 a.m. on December 9, 2001, Durham, North Carolina-based novelist Michael Peterson made a frantic call to 911 to report an accident. His wife, Kathleen, had fallen down a flight of stairs and was unconscious, but still breathing, in a massive pool of her own blood. Michael, who claimed he had been sitting out by the pool, was not sure how it had happened—he just knew that he needed help. By the time the paramedics arrived, it was too late. But the police weren’t convinced that Kathleen had fallen, or that her death was an accident at all. Within two weeks, Michael Peterson would be indicted for the murder of his wife, and the case—which stretched on through 2017—only got stranger from there. There’s not a lot one can say about The Staircase without giving too much away. So if you’ve yet to watch all 13 episodes of the compelling docuseries, which is now streaming on Netflix, bookmark this page and come back once you have. For those of you who have powered through it all and are thirsting for more details on the case, read on. 1. IT’S NEW TO NETFLIX, BUT IT ORIGINALLY PREMIERED IN 2004. If you had a sense of déjà vu while watching The Staircase, it could very well be because you’ve seen it before—at least most of it. A truncated, two-hour version of the miniseries, which is directed by French filmmaker Jean-Xavier de Lestrade, first premiered on Primetime Thursday in the summer of 2004. The completed docuseries made its television premiere one year later, first in England and then in America (on the Sundance Channel). In 2012, de Lestrade released a two-hour follow-up that continued the story. Netflix’s rendition includes all 10 of the original episodes, plus three brand-new ones, which follow some more recent developments in the case. 2. FILMING BEGAN SHORTLY AFTER MICHAEL PETERSON WAS INDICTED. But de Lestrade had a feeling that there was something unusual about Peterson’s case that would make for a compelling story. “When [Michael] was talking about his love with Kathleen, I really could feel that sincerity,” de Lestrade said. “But, at the same time, there was a kind of mystery about this man. It was a strange feeling.” Peterson was indicted for the murder of his wife on December 21, 2001; shooting on the series began shortly thereafter. 3. IT WAS ORIGINALLY SUPPOSED TO BE A TWO-HOUR DOCUMENTARY. Though de Lestrade knew that there was something different about Peterson’s case, even he couldn’t imagine the number of turns it would take over the next 15-plus years. It didn’t take long for the director to realize that his original plan to make a two-hour documentary on the case would barely even scratch the surface. “When we started shooting in February 2002 and when David Rudolf gave us access and the judge gave us access in the court room and we started to shoot and shoot and shoot then we realized how big it could be,” de Lestrade told Metro. “Because in the beginning it was supposed to be a two-hour film. It wasn’t supposed to be an eight-hour documentary series. But after six months of shooting, I knew we couldn’t tell the story in two hours.” Fortunately, the film’s distributors were receptive to the idea of a miniseries. 4. JEAN-XAVIER DE LESTRADE VOWED TO NEVER MAKE ANOTHER DOCUMENTARY AFTER COMPLETING THE FIRST SEGMENT. 5. DE LESTRADE HAS NEVER STEPPED AWAY FROM THE STORY. 6. FOR DE LESTRADE, IT WASN’T ABOUT PROVING PETERSON’S GUILT OR INNOCENCE. 7. BUT FOR THE RECORD: DE LESTRADE DOESN’T BELIEVE THAT PETERSON IS GUILTY. 8. THE CASE HAS BEEN A FRUSTRATING ONE FOR THE DIRECTOR. 9. AS BIZARRE AS THE “OWL THEORY” SEEMS, MANY PEOPLE BELIEVE IN ITS PLAUSIBILITY. The Staircase puts forth a number of possible theories about what could have caused Kathleen Peterson’s death, the most bizarre one being that she was attacked by an owl. More specifically: that an owl got tangled in her hair and, in an attempt to extricate itself, ending up causing her death. It may sound strange, but the autopsy report did note that Kathleen had pine needles stuck to one of her hands, clumps of her own hair in both hands, and a few small feathers entangled in one of those clumps. “When you look at her injuries, they do appear consistent with being made by an owl’s talons,” Mary Jude Darrow, Peterson’s attorney, told Audubon in 2016. “But I would hate to risk my client’s life or future on that argument.” Several animal experts agreed in the theory's plausibility, as did the film’s director … eventually. 10. PETERSON CALLS ACCEPTING AN ALFORD PLEA “THE MOST DIFFICULT DECISION” HE HAS EVER MADE. 11. 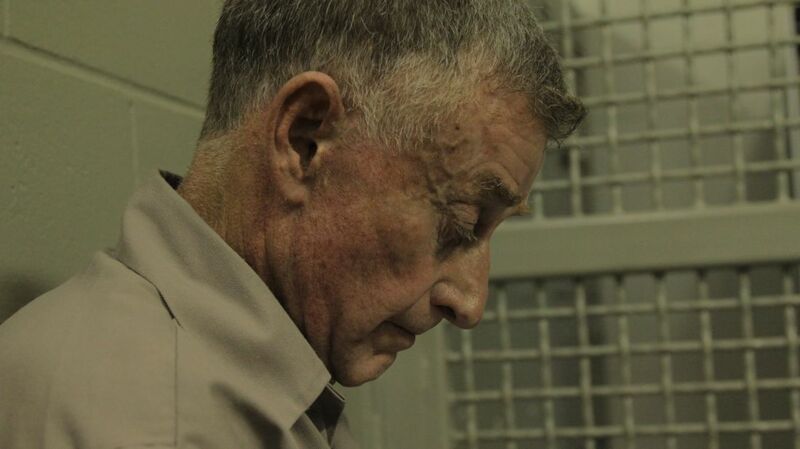 THE DOCUMENTARY’S EDITOR BEGAN A RELATIONSHIP WITH MICHAEL PETERSON. 12. IT'S TAUGHT IN LAW SCHOOL CLASSROOMS. Thomas B. Metzloff, a law professor at Duke University who was one of Michael and Kathleen’s neighbors at the time of her death, told The News & Observer that The Staircase is required viewing for his students—though he disagrees with the documentary’s suggestion that Peterson did not get a fair trial. 13. IT HAS A LINK TO MAKING A MURDERER. The Staircase has a coincidental link to Netflix’s first big true crime docuseries hit: Rudolf was the UNC clinical law professor of Jerry Buting who, along with Dean Strang, defended Steven Avery in Making a Murderer. 14. A PSYCHIC PURCHASED THE PETERSON HOME FOR $1.3 MILLION IN 2008. 15. NBC'S TRIAL & ERROR IS A PARODY OF THE STAIRCASE. Anyone who has watched NBC’s Trial & Error, starring John Lithgow, has likely noticed the many nods to The Staircase in the mockumentary sitcom (there was even a reference to the owl theory).